The November challenge at Vintage Stamping Challanges is all about colour! Red, Green, Purple and Blue! so that you can cross another card off your list. Leo has a gorgeous range of stamps and it seems to be growing all the time, well worth checking out! using red, orange and greens. The lovely lady is coloured in distress markers. and a little sparkle too. Really gorgeous card Dot. The background is lovely and the way you've framed the image is beautiful. I love this. The colours are great and I like the border and holly. Hi Dot, Gorgeous card. The background colours look so rich. Love the way you have framed the image. A wonderful Christmas card, the flowers look fantastic. I so like this Retro style for Christmas, something I would never have thought of. Gorgeous card, love those colours and the stylish image. Beautiful card, love the vintage image and your colors. Great design with the die cuts. Beautifully layered and adorned Dot, a gorgeous card for your collection. I'll have to make a mental note to sit tight on my chair when I arrive here Dot, your music always makes me jump out of my skin. A beautifully traditional looking Christmas card Dot, there's another image I 'need'. Awesome card! THanks for joining us at Die Cuttin DIvas. Wonderful card! !Thanks for joining us at DCD this week! Lovely Vintage card!! Thanks so much for playing along with us at The Pink Elephant!! Gorgeous card Dot…love the elegant lady and fab details…thanks for joining the Divas! 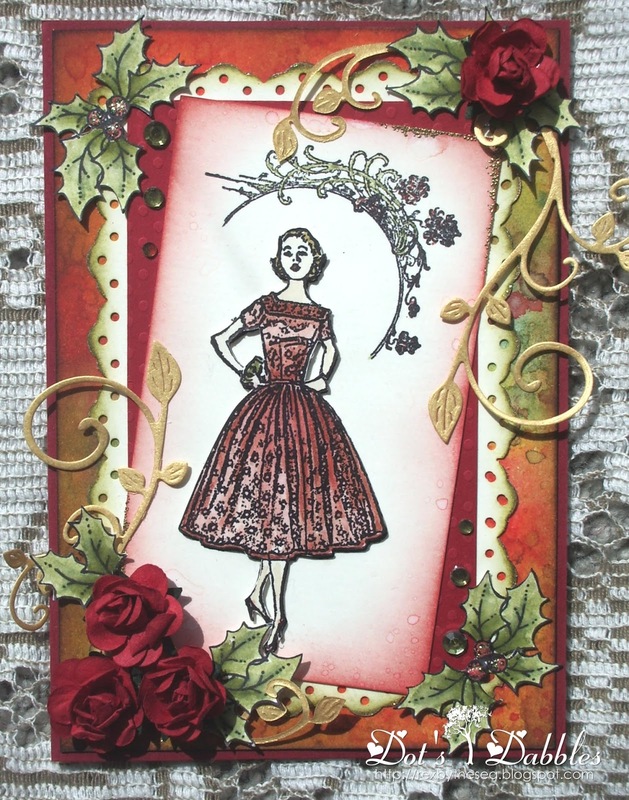 A gorgeous vintage christmas card, love the layout…thanks for joining us at Divas! I have to say that this just blew me away Dot it is fantastic. How do you do it girly everyone so different but all amazing. Thank you sweets.